In May the Fair Labors Standards Act (FSLA) was updated (from 2004) to raise the minimum salary of exempt (from overtime) employees from $23,660 annually to $47,476. This will go into effect on December 1, 2016, according to the Department of Labor. This means for employees making below the minimum, the employer will have to determine how to characterize the position and/or salary. Some are asking questions about how this might affect church employees. Now is the time for the disclaimer. This isn’t a legal opinion, nor is it binding. Practice and judicial interpretation may alter how the FSLA is interpreted. There are a few things that are important to know about the FSLA. The Act was originally adopted in 1936 as a way to combat unfair labor practices during The Depression. It applied primarily to commercial businesses. The judicial system has interpreted its scope over the years to also protect church employees who are engaged in commercial business, as well as custodians and administrative personnel in local churches. Here are some additional web sites that may help when you are conversing about the FSLA. After reading a few articles and some judicial cases, it seems there will be three options churches and employees may choose. The church may interpret the new law as binding for all of their exempt employees, thus raising salaries to the minimum $47,476 mandated by the law. This may result in fewer employees and more responsibility given to those who are left. It is doubtful if many churches will go in this direction. The church may change the status of employees (making below the minimum) to non-exempt. This means they are eligible for overtime. This is a great strategy for the church to compensate workers who work a consistent 40 hour work week or less, thus never incurring overtime. Therefore, the wages of these individuals will not change even though they make below the new minimum. Only their status will change. The church may lower wages and allow for overtime. This will cause churches and employees to calculate when their busiest times of year fall, planning for higher compensation during these periods. 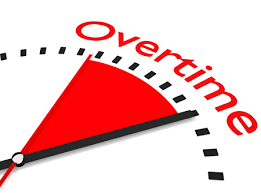 For youth ministers who spend entire weekends with students during the school year and more than a week with them in the summer at camp and/or on mission trips, this may cause an interesting math problem as churches and employees estimate the amount of overtime. In these situations, an employee can be paid an agreed upon weekly or hourly rate while being classified as non-exempt, thus eligible for overtime during the busy times of the year. Can the minister’s exception be applied to the new FSLA law? Maybe. Maybe not. In Shaliehsabou v. Hebrew Home of Greater Wa., 363 F.3d 299 (4th Cir. 2004) the court affirmed the decision to grant the minister’s exception for a lay person with a religious degree and a clear religious function in a suit claiming overtime wages. This means the lay person was not allowed overtime wages. However, the appellant court left the door open as it amended the ruling saying the plaintiff (the lay person) didn’t do enough to challenge the exception. In short, the case law is not well developed enough to tell us if a challenge by a non-clergy person regarding overtime wages would fall within the minister’s exception. Furthermore, if the minister’s exception is used on a lay employee, might it change the individual filing status with the Internal Revenue Service? This is another topic for another day. But, it is something to think about. In conclusion, the new law (set to be updated every three years) can provide a healthy guideline as churches and employees negotiate employment compensation. It does set a new standard that the church needs to pay attention to if it is to compensate professional employees in a fair and reasonable manner.